Today started out gray and gloomy, but when Dan came in from the garden with our first 3 Heirloom tomatoes of the season, I was inspired to make lunch using some of the tomatoes along with a number of other items we call “mezethes” or appetizers in Greek. Remembering the sun-drenched days we spent on taverna patios in Greece, I could just taste those tomatoes that are like no others. Sweet, juicy and meaty, we could never get enough whether in a salad or just sliced on a plate. 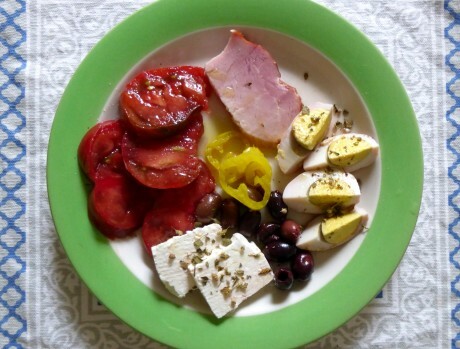 So that’s what I did…sliced the tomatoes on a plate and added creamy, salty feta cheese, kalamata olives, quartered hard boiled eggs, ham and hot banana pepper rings, all sprinkled with oregano, olive oil and vinegar and pretended we were back in Greece. 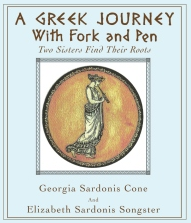 The only thing missing was the Retsina wine and crusty, fresh-baked bread. Mmmm…good! It hit the spot and sent me in to the computer to look, once again, at some of our photos of our many visits to Greece. Funny how a taste or a smell can take you right back to another time, another experience. Even though nothing compares to being there, the memories and photos will do for now!! When’s the last time you took a trip down memory lane?? See you next time. Yassou! It was great-and these tomatoes were good but Greeces still were better. A nice mix of flavors that’s for sure! Our heirloom tomato seedlings are only 2 inches tall at this point, but they are So worth the wait until September, when they are huge, and red all the way through! My favorite combination is with feta and herbs. Your family definitely influenced my palate on Berkeley Street! Those were the days ! Lets hope for more over there !! Even though I had a Gyro for lunch today, it doesn’t compare to what your dish looks like – and those heirloom tomatoes – Ohhhh! Hi Maddie, I know…the heirlooms are delicious. We love having feta and olives and tomatoes with white bean salad. I like to keep that on hand, although we go through it pretty fast!! Hi Georgia! Seems like eons ago, doesn’t it??!! Fingers crossed…one of these days after everything else we’ll be back! Hi Penny, there’s nothing like tomatoes from the garden, but for whatever reason, they still don’t taste like the ones in Greece. They are, however, better than store-bought! Glad we could influence your palate in such a good way! Hi Danny, I agree. All our tomatoes should taste so good!! We try to eat this everyday…those toms look incredible..